I've mentioned before, I have the full EV Nova card game though few to play it with, and I used to play Yu-gi-oh though matt whomped me and noone to play it with anymore either. I recently picked up a starter pack on the Stargate Online TCG. The interface is solid, and there are available people to play against. The game is unique in the TCG world, whereas there are several methods of winning, and the focus is on exploration and winning missions not combat. You can perform a variety of actions on your villain turns, and a variety of events on your hero turns. 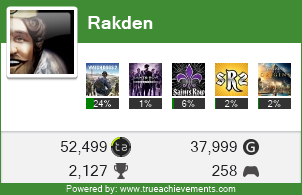 I've been going by Rakden on it, if you get bored drop a 10 spot and stop on. Cheaper than online poker, and twice as fun. Seems there are tournaments and what not as well but I fear I'm too terrible to compete in one anytime soon, they do look like fun for those who like that competitive thang. They cost "event" tokens which are a buck a pop, Tournys range in cost from 1-25 token/tickets as far as I can tell the rewards falling in line with that. Even the smaller ones have decent rewards, get from one to several packs of cards plus special foil cards. Another neat thing is if you collect a full set you can redeem them for a free set of physical cards to play "offline". Also check out the Nerd Handbook, It's a good read to understanding the geek/nerd mentality. Went to Avenue Q on Thursday Night. Amazing musical. Touches on the subjects we all think about every day, but are to PC to talk about. Standard Pubs will likely hate it, given the closet investment banker republican. If it comes back to the area I'll def max go see it again. I paid nearly 130 bones for 2 tix to it. Worth EVERY friggin penny. Puppets rawk. I love Final Fantasy I. Check out Basilisk Games for classic, CLASSIC style new RPG. Got my reserve of Super Mario Galaxy today. It's tittttts. Words don't do it justice. A true sequel to Mario 64, none of that Sunshine BS. Go buy this now, go buy a wii so you can buy this now. Go sell your cousin off into slavery so you can buy this and a wii now. Also feel free to enjoy some random shots of all my spiderweb games. Patches also seems to enjoy. I realized that after my Avernum 5 order today I own every single Spiderweb Software game going back to Exile sans the original Nethergate. All the hint books too. I lean democrat, you all know it. I think the republican party as it stands, stands for corruption, big business, and in recent years are having a sharp inclination toward facisim. I've been rooting for Mike Gravel, and the democrats in general but they are bending over and giving Bush more money. In the last debate none of them said, we are pulling our troops home. They all beat around the question and said well it's hard to tell where we'll be. Wrong answer, I need someone who is going to grow some balls and do the right thing. I will be registering Republican so I can vote for Ron Paul in the caucus. I'll then be re-registering in my current fashion of No-Party affiliation because I am independant, I lean toward the Democrats but I will not blindly follow any party or candidate for any office. America is in dire shape, it was my hope that the Democrats could bring back our flock that has gone astray but I fear they are too worryed about "offending" a donor to put forth any real change. We need Ron Paul as President to turn this ship around before our imperialistic fortitude brings down the wrath of the world on us. We're America, we're supposed to be looked up to, not regarded as imperialistic fools. Lets bring some real freedom and real pride back to this Nation. Ron Paul 2008. Besides if Ron Paul wins the GOP nomination it's win win, Anti-War vs. Anti-War. Dems will have to grow some balls then and actually debate their issues. Any way you slice it Ron Paul's movement is good for America. Also I think I got all my Florida Pix uploaded, check out the flickr link off to the right.